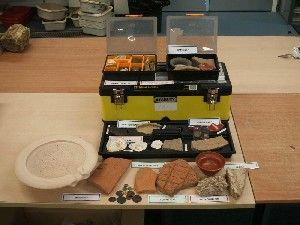 Each box is packed with real artefacts excavated from archaeological sites around Surrey, and replica items to show you what they would have originally looked like. They also each come with a teachers pack containing information about the artefacts, a summary of the period, case studies of Surrey sites and suggested activities. Each box costs £30 to hire for two weeks and must be collected and returned to the Surrey History Centre in Woking.